Baby #2 at 12 weeks.....is it a boy???? Well, just when I think things are settling down for us and we may have this parenting thing figured out, I find out I'm preggers with baby #2. Who am I kidding??? Things have never settled down for us and we still don't have this parenting thing down so why not add heat to the fire! I mean really...why not?!?!?!? Here are my thoughts....maybe if there are two, things will settle down a bit b/c the babies will entertain each other? HA,HA,HA,HA! Yes, I know I'm just kidding myself. But, I continue to try to convince myself of this so lets not burst my bubble. 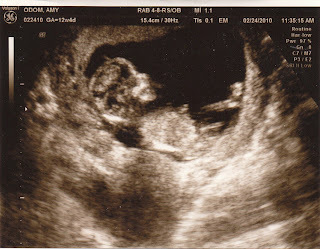 Good news: I'm now 15 weeks pregnant and the baby is doing great. They also think it's a boy! That's a change right?!?!? Clay and I kind of thought we would have all girls. I don't know why...it was just a feeling we had. We know what to do with girls but boys....not so much. I've already had some girlfriends tell me some funny boy stuff that I can't imagine myself dealing with but I guess you just figure it out as you go. At least we won't have to deal with massive diaper rash this round. Well, I don't think boys get diaper rash like girls??? Maybe they do. Again, something we'll possibly figure out soon. Regardless, boy or girl...we're so excited! More bad news: I've already gained 17 lbs. Can you believe??? See...you wonder why I hate this. I'm not even half way there and I've already gained more than half the weight I should gain over the full 9 months. NICE! Now I can only gain 10 - 15 lbs at most over the next 6 months. Now, in my defense, I'm sure the holidays helped me with the weight gain but it doesn't make the situation any better. In addition, I'm fairly certain the mass amounts of cocoa pebbles along with the multiple packs of Reese's peanut butter cups isn't good either. You gotta love the cravings. Clay keeps bringing Reese's peanut butter cups home for me. It started with a 2-pack a couple times a week. Then it became a 4-pack a couple times a week. Then it was 8-packs. And then he just decided to bring home a whole bag (No he didn't!) which I proceeded to eat in one evening. He says it's the only thing he can do right now that will make me happy. Poor thing! I think he really feels this way. Hormones are awesome! So, I started feeling real guilty about the chocolate cravings that I continue to satisfy with either cocoa pebbles, Reese's and/or chocolate brownies until I read in my Top 100 Healthiest Foods to Eat During Pregnancy book that you should add cocoa to your diet during the second trimester as it's high in antioxidants. No they didn't tell me this. Just when I was ready to cut myself off from chocolate for good they tell me I need it. Of course, they actually recommend chocolate milk vs. Reese's peanut butter cup so I figure that after I eat all my cocoa pebbles the leftover milk is the bowl is basically chocolate milk right?!?!?!? See...you can spin anything. Some good news: With Lola I did the same thing...massive weight gain in the first trimester. The good news is I was able to reel it back in starting at about month 4 and I only gained 25 lbs the entire pregnancy. I'm really hoping the same thing will happen with this pregnancy but at the rate I'm going (i.e. eat horrible, no time to exercise, etc.) it doesn't look like it's going to happen. No, I can't say that. It has to happen! If not, my obsessive compulsive personality will drive me insane thinking about it and the stress isn't good for the baby so I have to do it for the baby. I'm starting all new tomorrow....ready to start my day with a brisk jog in the morn, fill my belly with lots of rabbit food and cocoa of course b/c they say I need it. Some more good news: Overall, I'm finally starting to feel better (other than the depression of being pregnant). I have to say it's been a rough couple months. I was sick for a while. Not just morning sickness but wake up feeling horrible, the sickness would last until about 10:30 and then it would come back at 4:00ish and stay through the evening. Then I finally got through the nausea and fatigue and I had MASSIVE round ligament pain (stretching of uterus in lower ab area). For any of those who haven't had this....the pain is pretty much excruciating....it was even unbearable at times. It was so bad that I literally thought I was growing twins and I called to doctor to ask if I should come in asap so she could double check. She didn't think it was necessary. I remember having it slightly with Lola but nothing like this. The doc said some things can be worse with the second pregnancy and it all happens earlier. This just doesn't make sense to me. I mean my body was stretched and prodded by Lola for 9 months so you would think it would be able to take this one no problemo. Not so much.... Anyway, due to the round ligament pain, I couldn't really use my abs causing me to depend on my low back too much and I ended up pulling a muscle in the back. I was out for the count with MAJOR back pain most of last week. Ugh! Add the raging hormones, bladder that can't hold anything for more than an hour, constipation and the depression and this all equals pure joy! So, that's it in a nutshell so far! It's been just glorious! We're so thrilled for you guys!! Congratulations!